Year 1989, series of 1 sell No. 2650 of the Catalog Yvert, value 1€. 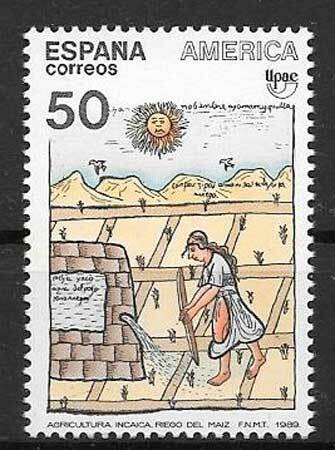 Inca culture, irrigation of corn. Year 1990, series of 1 stamp in block of 4 No. 2695 of the Catalog Yvert, value 4.80€. Fauna – Birds – Birds. 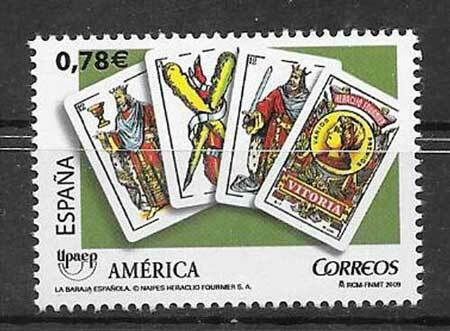 Año 2002, serie de 1 sello nº 3501 del Catálogo Yvert, valor 2.25€. Educación – analfabetismo. 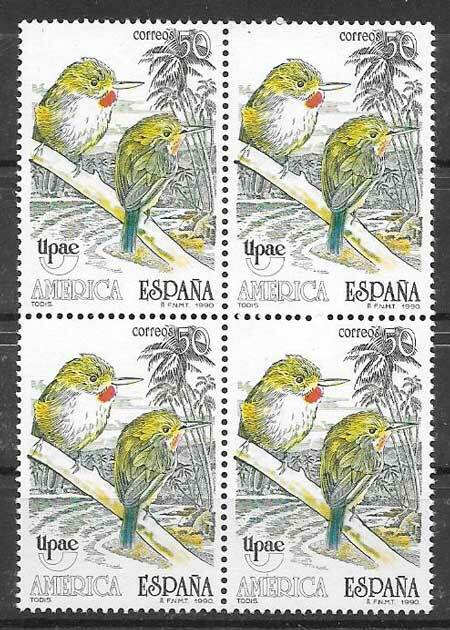 Year 2003, 1 stamp nº 3600 Catalog Yvert, value 1.50 €. 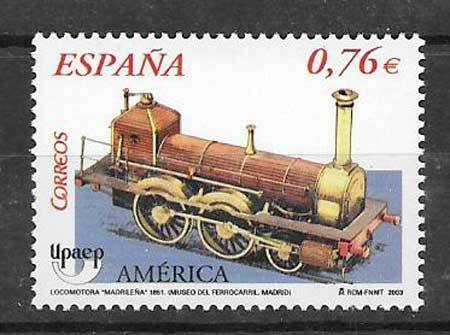 Rail transport – steam locomotive Long Boiler ” Madrid” railway Madrid – Anranjuez. Railway Museum of Madrid. Year 2004,1 stamp and a block of 4 No. 3699 of the Catalog Yvert, value 2.25€ and 9 euros respectively. American theme UPAEP. Protection of the Environment. Year 2005, 1 stamp and a block of 4 No. 3781 of the Catalog Yvert, value 2.50€ and 10€ respectively. Fight against poverty. 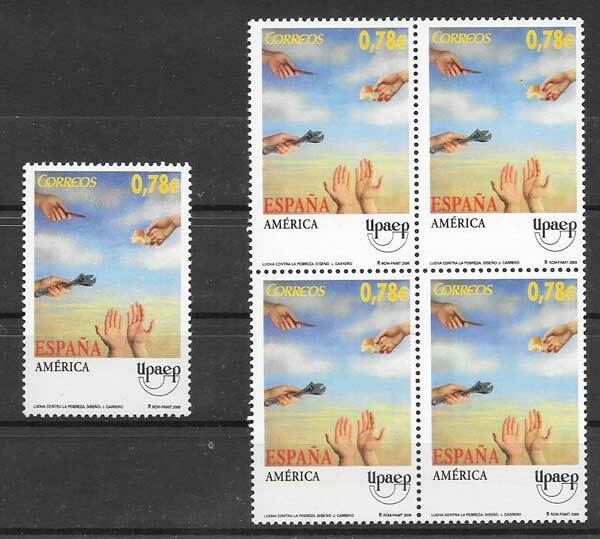 Year 2007, of 1 stamp and a block of 4, No. 3966 of the Catalog Yvert, value 2.40€ and 9.60€ respectively. Education for All. Year 2008, series of 1 stamps and a block 0f 4 No. 4064 of the Catalog Yvert, value 2.35€ and 9.40e respectively. 12 October national holiday. 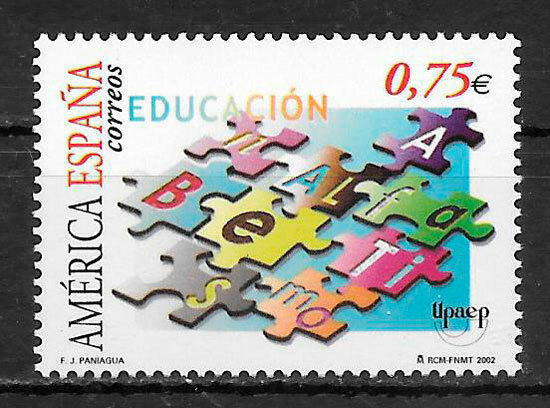 Year 2009, 1 stamp nº 4158 of the Catalog Yvet, value 2.50 €. Traditional Games – Cards in the deck spanish.